Από τις 29 Νοεμβρίου μέχρι τις 2 Δεκεμβρίου 2018 ο κ. Τορναρίτης επισκέφθηκε την Κωνσταντινούπολη, όπου συμμετείχε στις εργασίες της 11ης Συνόδου της Ολομέλειας της Ασιατικής Κοινοβουλευτικής Συνέλευσης και προήδρευσε της Επιτροπής Οικονομίας και Αειφόρου Ανάπτυξης της Συνέλευσης. Κατά τη διάρκεια της παραμονής του στην Κωνσταντινούπολη, ο κ. Τορναρίτης παρακάθισε σε επίσημο δείπνο που παρέθεσε προς τιμή των συμμετεχόντων στη Σύνοδο, ο Πρόεδρος της Τουρκικής Εθνοσυνέλευσης και Προεδρεύων της Συνέλευσης, κ. Binali Yildirim, με τον οποίο είχε ιδιαίτερη συνομιλία. 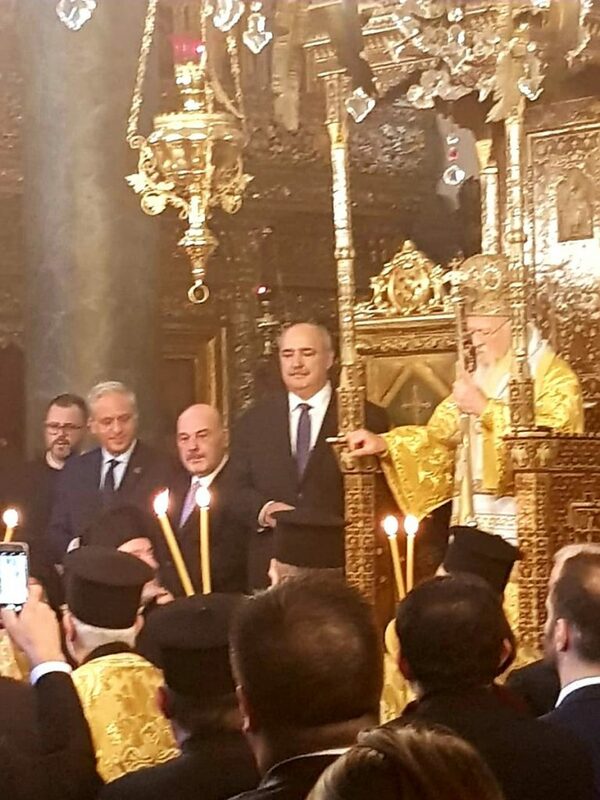 Περαιτέρω, στο πλαίσιο του δείπνου, ο κ. Τορναρίτης είχε την ευκαιρία να πραγματοποιήσει άτυπες επαφές με αριθμό Προέδρων και Μελών άλλων εθνικών κοινοβουλίων, που μετέχουν στις εργασίες της Συνέλευσης. 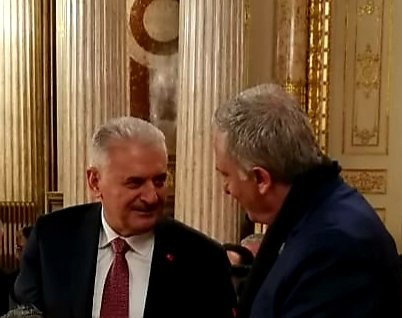 Κατά τις συναντήσεις αυτές, όπως και σε άλλες άτυπες συναντήσεις του στο περιθώριο των εργασιών της Συνόδου, ο κ. Τορναρίτης επανατόνισε τη σημασία της ενίσχυσης των ανταλλαγών μεταξύ Ευρώπης και Ασίας και τον κομβικό ρόλο που μπορεί να διαδραματίσει η Κύπρος σ’ αυτό το πλαίσιο. Στις 30 Νοεμβρίου ο κ. Τορναρίτης παρευρέθηκε, επίσης, στη δοξολογία για τη Θρονική Εορτή του Οικουμενικού Πατριαρχείου εις μνήμη του Ιδρυτή και Προστάτη του, Αποστόλου Ανδρέα και στη συνέχεια παρακάθισε σε γεύμα που παρέθεσε ο Οικουμενικός Πατριάρχης, κ.κ. Βαρθολομαίος, με την ευκαιρία των εορτασμών. Κατά τη διάρκεια της τελευταίας μέρας των εργασιών της Συνόδου και απαντώντας ουσιαστικά σε σχετικές αναφορές προηγούμενης ομιλίας του Προέδρου της Τουρκικής Εθνοσυνέλευσης Binali Yildirim, ο κ. Τορναρίτης υπογράμμισε ότι η Κυπριακή Δημοκρατία είναι πάντα έτοιμη να προσέλθει σε διαπραγματεύσεις, για επίλυση του Κυπριακού στη βάση των σχετικών ψηφισμάτων των Ηνωμένων Εθνών και του διεθνούς δικαίου προς όφελος όλων των πολιτών της Κύπρου. Τόνισε επίσης, ότι η λύση θα είναι εφικτή μόνο με την απομάκρυνση του τουρκικού στρατού και την κατάργηση των εγγυήσεων. Our interconnected economic global environment adds to the challenges and threats faced by our countries and makes collective action essential. Issues of common concern include the effects of climate change, fostering sustainable development, the elimination of poverty, combating terrorism and promoting safety and security. The Asian continent is rich in resources and has a vast economic potential, which, if used wisely, can produce widespread benefits for economic prosperity across the area. Strengthening regional cooperation is also a crucial step in efforts to further enhance the development of Asian economies. Improved governance and a focus on greater access and inclusion within Asian economies, with sustainable development placed at the heart of policy planning, can lead the continent and its peoples to progress, while minimizing collateral costs. In this direction, the vast potential of Asia is recognized by its European partners. Europe and Asia are bound by historical economic and trading ties. The recent 10th Asia – Europe Parliamentary Partnership Meeting (ASEP 10), held in Brussels in late October 2018, debated the crucial issue of climate change and the environmental challenges of security, migration and the economy. During my intervention, at the time, I focused on deepening further the engagement, dialogue and activities between the EU and Asia, particularly between the European Parliament and the APA, with the aim of reinforcing political, economic and socio-cultural cooperation. 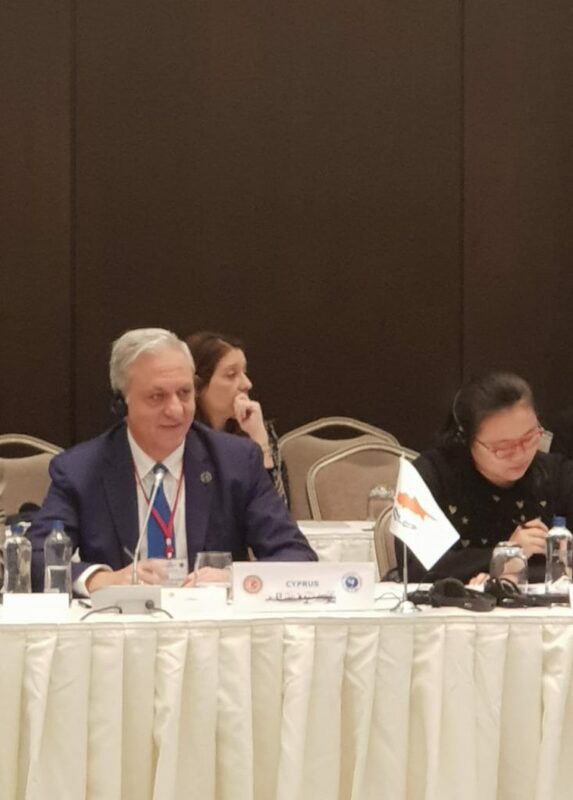 Cyprus, being a bridge between Europe and Asia and the only EU country member of the APA, can have an invaluable contribution to this end, especially in the energy field, a sector that has been highlighted in the Joint Communication, before the ASEP Meeting. Thanks to its recently discovered energy potential, Cyprus can become an energy hub in the Eastern Mediterranean. Prospects in the energy sector are all the more promising thanks to the island’s geostrategic location, connecting Europe with markets in the Middle East and Asia. The 2030 Agenda for Sustainable Development is the ideal platform, through which we can coordinate our actions and achieve tangible results concerning the promotion of both security and prosperity in Asia, as it dictates a strong focus on peaceful, just and inclusive societies and also directly acknowledges, on a global level, the link between peace and sustainable development. Our fundamental goal as APA always remains the wellbeing, progress and prosperity of our citizens. In this respect, we must strive to foster national and international measures designed to promote the concept of a peace culture, combating all forms of violence, outlawing terrorism and promoting education for all. The UN 2030 Agenda essential elements that comprise development are common for everyone and include, amongst others, education, health, gender equality, empowerment of women, girls and young people, targeted support for small and medium enterprises, environmental protection and the protection of human rights. As APA legislators, we need to promote policies that consolidate such goals and ensure sound institutional structures through our legislative and scrutiny functions, that our systems of government are based on. Cyprus is committed to the implementation of its sustainable development policy, in line with UN Agenda 2030. On the national level, particular focus has been placed on the promotion of the use of renewable energy sources and of sustainable tourism policies. 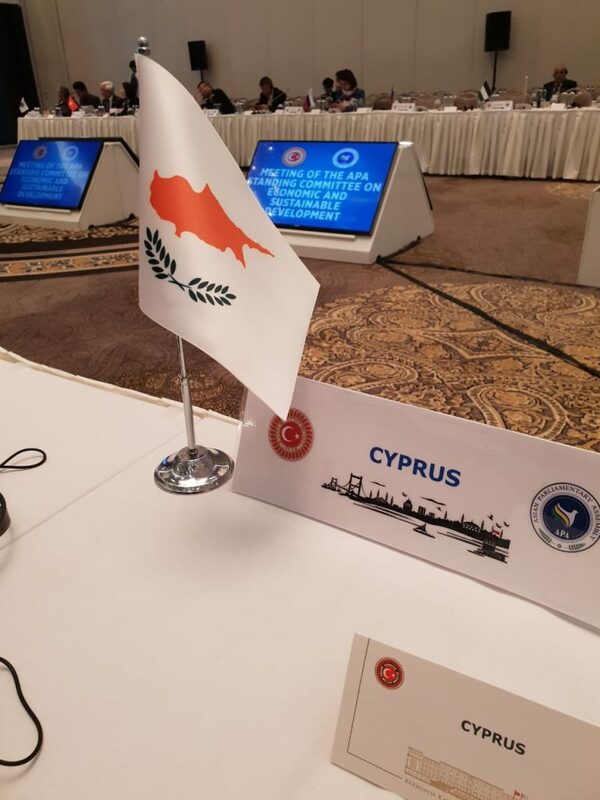 In the international sphere, Cyprus actively upholds international cooperation on related issues. In our efforts towards furthering interaction and collaboration to implement and monitor sustainable development policies, parliamentary diplomacy is of crucial importance, in order to draw from common experiences, challenges and expertise in fostering transformative policies and actions. As we work together to set out an action plan, towards promoting economic prosperity in Asia, our goal should be to harmonize efforts and adopt a common stance on issues of mutual effect, as this would be a concrete foundation on which we can further build on. It has been a particular honour and joy for the Cyprus Parliament and myself personally, to chair this Committee for the past year. The issues that fall within the scope of economic and sustainable development and within the mandate of this Committee, are issues that concern all of our countries and peoples, as they have a direct impact and effect on the quality of life of our citizens. The link between economic prosperity and sustainability has rightly been recognized by the UN as a global priority, with a concrete action plan put in place in the form of the 2030 Agenda for Sustainable Development. I am confident that, through the work of this Committee, we can coordinate efforts, so as to achieve these ambitious global goals, at the same time reinforcing relations and cooperation between us. In this respect, I am very pleased that the Meeting we hosted in Pissouri, Cyprus, last June, paved the way towards the establishment of a more systematic cooperation and exchange of views. Apart from the Energy Advisory Group, two additional working groups were established, namely the Working Group on Green Funding and the Water Crisis Working Group, through the initiatives of Russia and Iran, respectively. All three groups focus on green energy, renewable energy sources and the sustainable management of resources. I am confident that, through a systematic and focused work in these groups, we can step up efforts to codify tangible proposals for our respective governments, that can be injected into national policies and eventually produce concrete results. 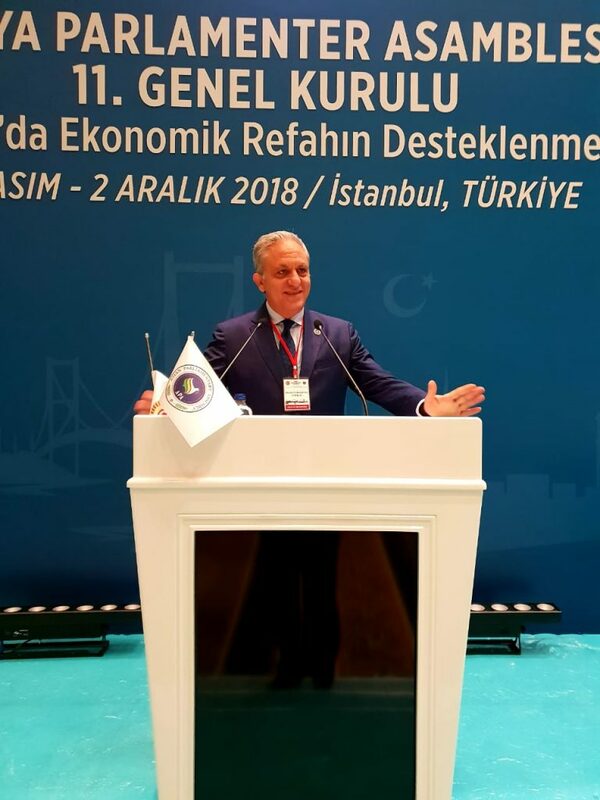 Your increased participation in our Meeting in Cyprus constituted tangible evidence of the importance you all attach to fostering cooperation among us. A cooperation, based on the fundamental values of mutual understanding, respect and solidarity. I am confident that we will spare no effort in rendering this cooperation as solid and as productive as possible.